Hello again, haven't posted for a while as I've been away travelling in the Red Centre and Top End. Magic parts of Australia I hadn't experienced before. Quite a bit to digest visually and I'm in the process of trying to make some work that takes me back there. But as usual, tend to get a bit side-tracked. I'm still working on my BAO book and waxed a few more pages today. Shouldn't be too long before I start getting my addresses to post to. My group (group 1 )seems fairly quiet at the moment but that's probably because they too are all busy getting their books together. 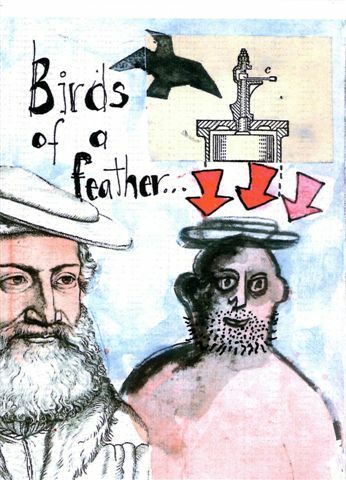 Just sent off a few of my new zines "birds of a feather" and thought you might like to see one. It's a little folded page of 8 collaged drawings rather that hint at how we sometimes take on the attributes of our favourite animals. Send me your postal address and I'll send you one, that will give them a small audience to make them feel as though somebody cares. No problems, it would love the long flight. Hi Jack, I would be delighted to have a zine. I'll send my address. I took some of your zines and little books to my book arts group, they really enjoyed them. Australia sounds so exotic and wonderful to me. Glad you enjoyed your trip. Thanks Judith,your address arrived and the "birds" will be in flight soon. Another great zine Jack. Hope you had a great trip and I look forward to catching up sometime soon.